AVAILABLE NOW! The 2nd edition of Dr. Shari Bridgman's popular book on miscarriage, In Heavenly Arms. 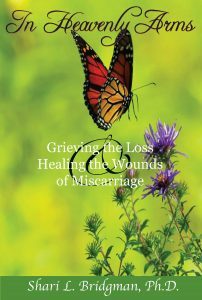 We are excited to announce the release of the second edition of Dr. Shari Bridgman’s highly popular book on miscarriage and still-birth, “In Heavenly Arms: Grieving the Loss and Healing the Wounds of Miscarriage.” It is available on most online booksellers, including Amazon. It is available in paperback and in Kindle versions. The first edition received world-wide attention for two decades. It was a ground-breaking work in this area, being the first book to actually use guided self-help exercises to assist the reader in moving through the grief process. Additionally, it was the first book to provide the structure and materials to enable people to start and run their own face-t0-face, self-help groups at their own churches or other organizations. Continuing its history of quality and excellence, the 2nd edition contains updated information on the newest psychological and medical information as well as current resources. New accounts from the lives of survivors and families makes this already outstanding resource even more powerful and helpful. Since as many 1 in 4 first pregnancies end in miscarriage, it is likely that someone you know and love has been impacted. Feel free to share this post to your favorite social media platform by clicking the link above, left!